Across the country, municipalities are engaging citizens in composting as a means of reducing the waste stream. Anywhere from 15 percent to 30 percent of trash being hauled to landfills is organic matter that could be composted and returned to the soil. There's no reason why the piles of scraps we produce in the coarse of cooking meals can't be recycled to enrich our soil, make more food, and help reduce greenhouse gases. It's a perfect trifecta in which people and the planet win. So you might think we here in the nation's capitol would be on the cutting edge of the composting movement. As head of a local gardening organization in the District of Columbia, I routinely field questions from citizens eager to compost their kitchen scraps. Even non-gardeners are looking for ways they can do the planet a good turn. So where is the city's compost? We caught up with the District's head of public works, William Howland, at a recent community and garden club meeting where he was speaking on the subject of recycling. We asked the question and learned that the District of Columbia--our nation's capitol, now presided over by a young mayor who swears we are going to be a green city--has no municipal composting program and none on the horizon. What about all those leaves the city collects in the fall--10 tons of leaves? According to Howland, these were routinely trucked off to landfills in years past. Recently, there was a pilot program to compost leaves on city property in the Maryland suburbs. A project to compost leaves collaboratively with the University of the District of Columbia at a facility in Beltsville, MD, is being discussed. Still, local garden legend tells of a municipal compost pile somewhere near the Capital. No sooner did I report on the local blogs that the District has no compost than a local gardener shouts back that this long-rumored compost pile does in fact exist. It has an address. I am soon in hot pursuit. And now I can tell the world that the nation's capitol does, indeed, possess a pile of what gardeners call "leaf mold," meaning the composted remains of leaves collected in the fall. We're not exactly sure where it comes from. And having finally located it, I can say that there has never been a compost heap more difficult to find or more completely obscured from public view. 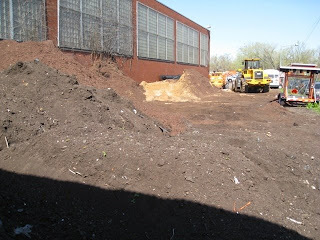 This pile is next to a public works vehicle garage and trash dumping site at New Jersey Avenue and K Street SE, a scene of scruffy industrial buildings and dusty lots wedged between an elevated freeway, a busy commuter route and some railway tracks. Since it is not far from an area where development is being spurred by the addition of a new baseball stadium, there are also, oddly, spanking-new apartment buildings rising overhead as well. I thought I had landed in an outtake from "The French Connection." Before me stood a vast collection of dump trucks, snow plows, salt spreaders and street cleaning vehicles. The lot was jammed with private vehicles as well, yet not a human being in sight. I circled, probed, and circled again looking for this compost. 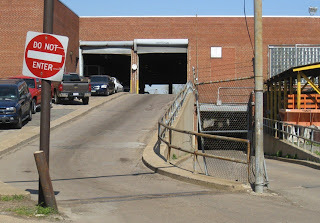 I discovered that to get into the lot, I had to choose one of two ramps leading into and through a rather scary looking brick building lorded over by a tall smoke stack. Finally I spotted two men working on a water tanker. "Where's the compost?" I asked. "There! Over there," they said, pointing to a big, yellow front-end loader off in the distance. I drove to the spot and, sure enough, there in a far corner of the lot were three different piles of material: sand, mulch and a dark, rich-looking compost. The front-end loader was blocking the path into the area. I had to take my 1997 Toyota Corolla "off road" to get closer. So here's a picture of what the District of Columbia's compost (or "leaf mold") looks like. Good stuff, if you can get past the bottle caps, pieces of plastic trash bags and other debris that come with it. I returned the following day to fill a trash can and some 5-gallon buckets. It's time to top off the garden containers at my daughter's charter school. It was a moment of personal triumph: I had finally tracked down our own local, publicly financed compost. And it's free! But I can't help being nagged by a persistent question: Can't we do better? Maybe you can point your city officials to little ol' Lawrence, Kansas, which has a pretty good composting program: http://www.lawrencerecycles.org/organicsdistribution.shtml. I'm a little late to commenting here...I was doing a search for local composting, in an effort to reduce my waste a bit. This is a related issue,but my office building which ostensibly "recycles" actually doesn't. We separate, they comingle. I think DC has a huge way to go! It's great that DC composts these leaves. It's great that DPW encourages composting. 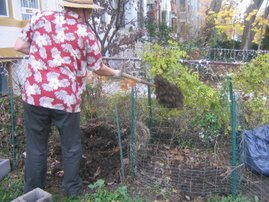 What's not so great is that DCRA asserts that maintaining a compost pile on a residential property is illegal because it attracts rats. Note to anonymous: we don't normally publish anonymous comments. But thanks for that reminder about D.C. law. Do you have a link to it? I just moved to DC from San Francisco and am missing the municipal composting! I plan on getting a worm bin in my apartment but I would still like to see composting available city-wide. I see this post is about a year old. Do you know if there has been any progress made? Or who would be the appropriate people to talk with to get this issue moving? 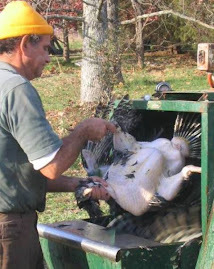 Heather, D.C. still does not have municipal composting. The leaves collected in the fall apparently are being composted--but not sure exactly where or how. The Department of Public Works recently sent out a notice saying composted leaves would be available to the public between March and October next year at the Benning Road and Fort Totten transfer stations. The contact for that is Kevin Twine at DPW, 202 671-2593. Please let me know if you get hold of him as I will be trying to track him down myself to get these questions answered. In addition, Common Good City Farm plans to take your food scraps for composting beginning in the spring, but asks that you bring some "brown" material as well. Awesome! Thanks. I know where this is (close to the sand bag pick up from the flood), and I think I'll go get some. I'm concerned about heavy metals, rainwater chemicals, etc, though. As of today (Friday, 26 April 2013) the site at New Jersey and K SE no longer exists. Whatever it was and wherever the entrance was, I could not find it today. Blame development. However, the Fort Totten Transfer station has free stuff. I loaded up with a number of bags -- probably my 90 gallons. It looks great and was great to use for planting my camellias in my backyard this afternoon. 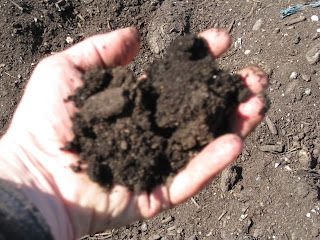 It's like a combination of mulch and compost -- rich and brown with large chunks and lots of smaller bits. I mixed it with some gravel (for drainage) and my native soil (a combination of clay, topsoil, and years-old mulch). There was some trash in the mulch -- I found a metal spoon and there were other metal things there that other people had put to the side. No big deal. While planting, I only found one other significant inclusion: a piece of yellow plastic. I don't know what the hours officially are -- none are posted on the DPW website or at the Fort Totten site. I got there around 11:00 and when I was about 3/4 done, an employee came over and said -- politely -- that they didn't open until 1:00 p.m. but he would let me do my thang. I thanked him and asked him about tomorrow's hours -- he said they open at 8:00 a.m.